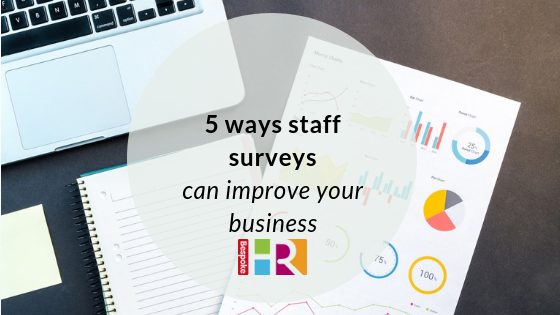 Conducting staff surveys not only allows you to get a better understanding of how your staff feel about working for your organisation, but when implemented correctly and followed up with visible actions, they can help boost morale and in turn your organisation’s productivity. Re-engage existing employees and reduces recruitment costs: keeping hold of existing talent is essential and understanding staff perspective is a good way to do this, rather than relying on anecdotal feedback. This is particularly important in a workplace where the business may have grown substantially over a short period of time, and staff may feel out of touch with the original company ethos. Highlights areas needing improvement: there is no better way of understanding where the gaps in your HR and people management processes lie than asking employees directly. Surveys can demonstrate where improvements need to be made, and where focus needs to be directed. Some small changes can have a huge impact on employee effort. Boosts morale: soliciting feedback from staff has been shown to increase engagement and improve morale – and can help to provide an action plan for optimising HR processes in the future. For one of our clients, Scitech, staff reported feeling appreciated, listened to and more motivated following its staff survey. Demonstrates management’s commitment to staff: once potential improvement areas have been identified, communicate these to staff and involve them in implementing these changes. By getting staff to own part of the action plan demonstrates you trust them and that you are serious about making improvements to their work. Promotes your business as a good place to work: this not only helps with the retention of existing employees but makes your organisation more attractive to the recruitment market and possibly even potential customers. Following its internal survey and action plan, Scitech went on to win a ‘best employer’ industry award which has gone on to drive new business leads. To see how a staff survey benefitted Scitech, read our full case study.